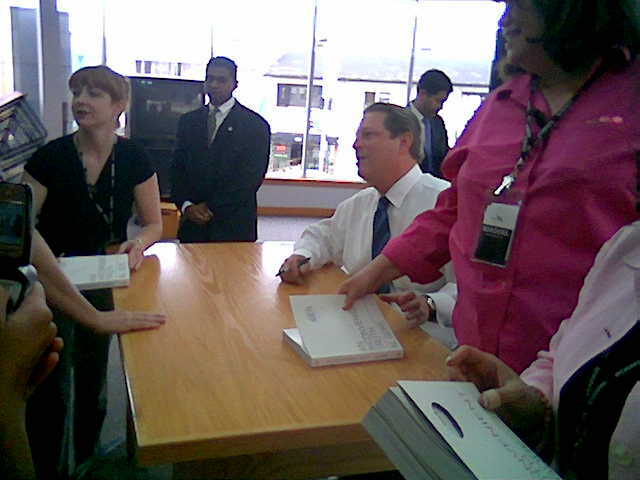 So I saw Al Gore at a book signing a couple weeks ago. 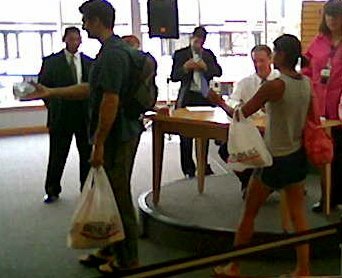 Signing copies of his book "An Inconvenient Truth." Well, the only inconvenient truth I encountered was the crazy witch in the pink wouldn't let him sign the book the way I wanted him to. How hard would it have been to write, "Stay Cool, Al Gore" That would have been awesome, putting the lie to his whole global warming propaganda. But this woman wouldn't let me. So I declare war on her. One other thing I noticed is that Al Gore attracts a lot of hot women, and no, I don't mean the humorless moron in the pink shirt. But check out the girl about to hand him her book. Lucky Al. I've got to get into politics. I think I'll run for dogcatcher. Baby steps, Rome wasn't built in a day etc.